N Brown is a FTSE 250 company with more than 20 different internet and catalogue home shopping brands, mostly selling clothing and household goods. You might even recognise some of them, such as Figleaves.com, Simply Be and JD Williams. The company was added to the UK Value Investor model portfolio in May 2012 at 241.5 pence per share. Last week I sold those shares for 359.1 pence, which produced a capital gain of 47%. Add to that a dividend income of 13.2p and the total returns were more than 52% in just 8 months. So what was it about this particular company and its share price that made it a buy at 241p and a sell at 359p? Investing for a reliable and growing income and capital gains is all about buying good businesses at sensible prices, and it’s easy to describe N Brown as a good business. The chart below shows the company’s results over the last decade. In the last decade the company was consistently profitable and raised its dividend almost every year. Annual growth has been well above average at more than 10%. But there’s nothing exciting about it, no twenty or thirty percent a year growth or new invention about to change the world. It’s just a solid business which has generated good results year-after-year. It’s one thing to find a good company, but that’s only half the story. The price you pay is just as important as the quality of the business you’re buying. So why exactly did a share price of 241p look cheap? 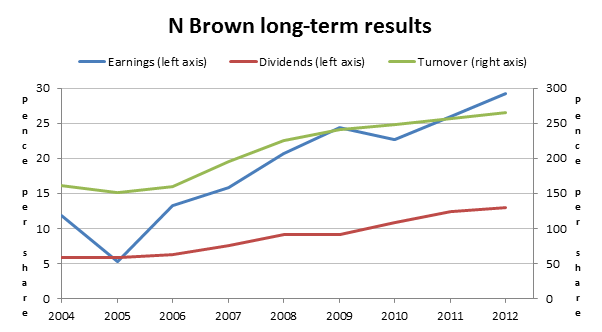 In the last decade N Brown earned an average of 18.8 pence per share, with the most recent amount being 29p. With the shares at 241.5p that’s a PE ratio of 12.9 relative to the 10 year average earnings, and 8.3 relative to the latest earnings. Both of those are lower than the market average, even though N Brown appears to be an above average business. In terms of dividends the story was much the same. The yield at 241.5p was 5.4%, well above the FTSE 100 yield of 3.6% and even further ahead of the FTSE 250. So this was a profitable, growing, dividend paying, market leading business on offer at a price less than the average business. For me that ticks all the boxes, which is why I personally bought shares in it, as well as adding it to my model portfolio. In October 2012, a slightly positive set of interim results caused the shares to jump 20% in a few days. That was followed by further strong gains up to a peak of about 380p shortly before I sold. Did I know in advance that this investment would return an annualised rate of more than 100%? Of course not, but I do know how to take advantage of these things when they happen. One of the central planks of the standard model of equity investing is that share prices follow a random walk. They go up and down in such a way that nobody can predict these movements in advance. It’s an idea that I largely agree with, and it underpins much of the investment approach that I use. Share prices may follow a random walk, but that random walk tracks the intrinsic value of each business in the long-term. The intrinsic value of a business is the sum of all future cash flows to investors, discounted at some appropriate rate. The problem is that nobody knows what the future cash flows will be, and each investor has a different discount rate. The result is that there is no single ‘correct’ intrinsic value, and even if there was, nobody knows what it is. So share prices are pushed and pulled around by supply and demand as investors buy and sell shares for a million and one different reasons. The fact that prices follow a random walk means that price alone can tell you very little about whether or not the next move will be up or down, either today or over the next few years. The intrinsic value of each business also follows a random walk as companies struggle to survive and thrive in a harsh capitalist environment. However, there are companies that have much more stable intrinsic values than the average company, and that’s where I look to gain an edge over most other investors. Take Tesco as an example (note: I own shares in Tesco). Of all the possible outcomes for that company, I would hazard a guess that the vast majority of them have the company growing in a relatively steady fashion over the next decade. In perhaps one future in a million, the company goes bust in 2014 after an incredible scandal. But on the whole, I think most investors would agree that the range of outcomes for Tesco is centred around steady growth rather than spectacular boom or bust. The same cannot be said for many other companies. Many companies could go bust or double in size in the next few years, based on just a handful of key events either working out or not (e.g. negotiations with a key creditor which could either allow the company to expand, or cause it to go into administration). If the signal, i.e. the intrinsic value of a business, is highly variable and uncertain, then making sense of share price movements becomes doubly difficult. It’s like trying to make sense of the changes in direction of a plane which is on autopilot in a storm, when the autopilot is tracking a randomly moving target (another plane perhaps) rather than a fixed destination like an airport. If the plane swings to the right then that in itself tells you little about whether the next move will be left or right, because the target is also moving randomly from left to right. If instead the target is an airport then the further the plane points in the wrong direction, the more likely it is (although not guaranteed) to swing back in the direction of the destination. The same principle applies in the stock market. It is far easier to value a business with a steady intrinsic value (a fixed destination) than one with a highly uncertain intrinsic value (a randomly moving destination). The further the share price moves from the steady intrinsic value, the more likely it is to swing back the other way. N Brown, like all of the companies in the UK Value Investor model portfolio, had a long history of gradually increasing and relatively stable sales, profits and dividend payments, with no obvious reason why the future should be much different. It also had a low price relative to those steady earnings and dividends, meaning that there was a better than average chance that the share price would go back up as Mr Market tried to work out the correct intrinsic value. In the end, that’s precisely what happened. The shares jumped to 380p, and I eventually sold at 359p. At that price the PE was 12.3 (about average), the price relative to the average earnings of the last decade was 19.1 (above average) and the yield was 3.6% (also about average). An above average business trading at an average price is still an attractive investment, but if I can sell one company at an average price and buy an equally good company at a much lower price, then I choose to sell. And an above average business, trading at a below average price, is exactly where the proceeds from the sale of N Brown will be heading over the next couple of months. Another great article and an excellent example of a value orientated investment in a UK company. The idea of buying shares in good companies at cheap prices is simple and effective. I know you like to look for rising earnings, divi’s and turnover. Is there anything else you look for i.e low P/E or P/TBV? Hi David, I look at PE, but use PE10 rather than the standard PE. 1 year earnings are too volatile to tell me much about a company, so I prefer to see what I’m paying for the past decade’s earnings. I don’t really look at book value these days. Occasionally it’s negative or meaningless, as with Next. I mostly look at the balance sheet for debt and liquidity but don’t use it for valuation. Why N Brown? Why not the other shares with lower rating. There were about 4 or 5 of them. Just wondering. I thought that question would come up at some point. I was originally going to mention the reason why but I guess it slipped my mind. It isn’t a very exciting reason anyway. Basically all of the companies in the portfolio are relatively new since the portfolio is only 2 years old. This means that many of them haven’t had enough time to grow, either in terms of the underlying business or the share price. They also haven’t had time to pay much in the way of dividends. This means that those companies in the red ‘sell’ zone aren’t really overvalued, as they’re all more attractive than the index. However, I like to have a plan and to stick to it, and the plan is to buy or sell one holding each month. So, having looked at the portfolio, I could see that N Brown was in the red zone, it was up about 50% in 8 months, which virtually guarantees that it’s a lot less attractive than it was when it was 50% lower. On that basis I was happy to lock in those 50% gains and to reinvest them over the next couple of months. It didn’t make sense to sell something like BP when the company hasn’t changed and the share price hasn’t moved much. Far better in my opinion to lock in 50% gains. Eventually the portfolio will settle in at 30 holdings, and most of the investments will have been in there for three or more years, which will give each holding more time to have actually contributed to returns. So in the longer-term I expect to sell holdings that are nearer to being the ‘worst’ from a ranking point of view. However, next time I sell something which isn’t the lowest ranked holding I will definitely mention it in the newsletter. As always John, thanks for your response. It depends on what you mean by tips. I can see that you have downloaded the free strategy guide, “How to build your own equity income fund”, so I expect you’re reasonably familiar with the particular strategy that I use to buy above average businesses at below average prices. In which case I assume you mean tips as in actual investment ideas? I try to do one of these short reviews every week or two as time allows.